POW! Nutritional punch! 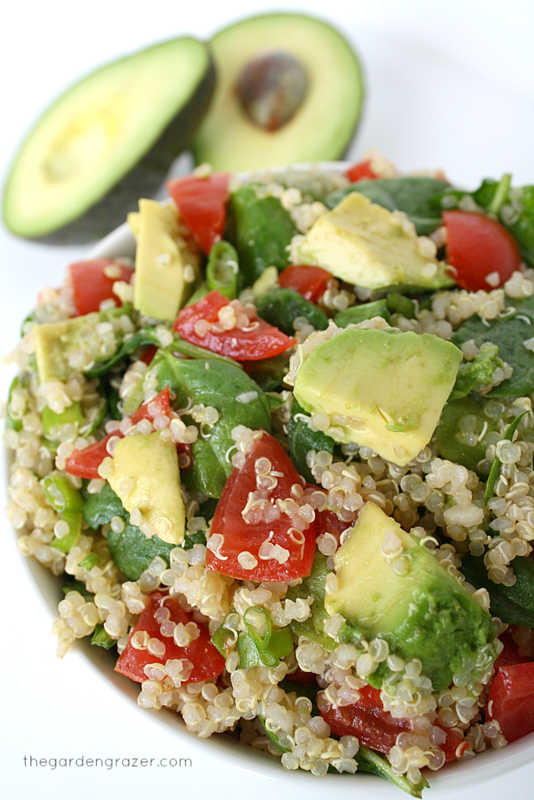 😉 Quinoa, spinach, and sweet cherry tomatoes join forces with bites of creamy avocado to bring it all together. 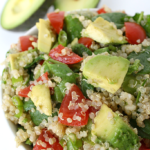 I find this salad to be a perfect marriage of filling and energizing. Have fun playing around with different variations! Add some beans for an extra protein punch, change up the veggies, or use fresh lemon/lime juice in the dressing instead of red wine vinegar. 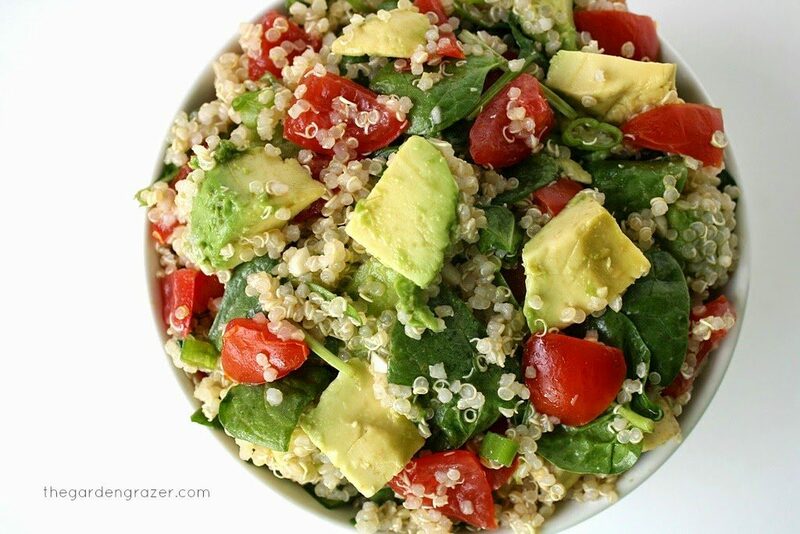 It’s our new favorite quinoa dish! Not to mention it makes a rock star take-along cold lunch. Hope you love it too! 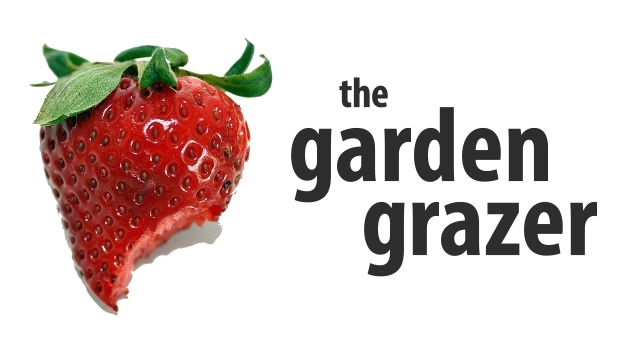 Come join The Garden Grazer on Instagram 🍓 and share a photo if you make this. I love seeing what you guys cook up! 20 of our favorite salads! yes! this looks so simple but incredibly delicious! Yum! Thanks! Going to make this tonight, since I am not vegan migjt add.some xhicken and call it a main dish! Awesome! Thanks for the message – hope you love it!! Made this to go with some grilled chicken; fabulous!!! I also added some goat cheese. This is a GREAT salad and easy!! Hi Mary Jane! So glad you enjoyed it!! Just made this dish. It's real good! 🙂 Thanks! I love your recipes. Have made several of them! This is the kind of salad I could happily eat everyday for lunch. Great dish, Kaitlin! This is soooo delish!! I have so much energy after eating this power salad. This is a must try!! If you are having this the next day should you eat it cold or heat it up? New to the site but was wondering if you post nutrition information? This sounds great! I would love to make it and portion it out for my lunches this week. Will it stay good refrigerated for a few days, or is it a dish that doesn't last more than a day or two? Hi Jennie! Yes! I've kept this in the fridge for about 4 days before. The avocado will brown a little so if that's an issue you could leave it out and add it right before serving. I don't mind, so I just do it all in the beginning 🙂 Hope you enjoy it!! I just finished making this! I had to substitute cucumber for avocado and added sugar to the dressing. I can't wait for my coworkers to try it. Thank you for this info. Brilliant! Hi Kaitlin! Just wanted to say that this recipe was absolutely delicious and has filled my lunch all week. I loved this so much I had to share it with all the readers on my blog. Thank you for sharing – I cannot wait to try more of your recipes. Hey Danielle! Happy to hear you enjoyed it so much – your photos are gorgeous! 🙂 Hope you love any other recipes you try! Hi Carolyn! YAY – so glad you enjoyed! Great to hear you adapted it based on what you had 🙂 Wishing you a lovely week! I used WW recipe builder and came up with 8 points for 5 servings and 6 points for 6 servings. Hey Jodi!! Aww thanks 🙂 So happy you enjoyed it! Wishing you a lovely weekend! Do you think I could use Balsamic instead of red wine vinegar for the dressing? Haha – yay!! Hope you love it 🙂 I find it to be so energizing! I just made this tonight–so light and refreshing! Awesome. Thanks! GREAT summer salad! I LOVED it! I saw this on Pinterest and I was so excited that I had all the ingredients on hand. I made it right away for lunch. It was soooo good! Thanks for the awesome recipe. I'll be making this over and over again. Score!! I love when I find a recipe and already have all the ingredients on hand! 🙂 Thanks for the sweet message, so glad to hear you enjoyed it!! I don't have any quinoa on hand but have everything else! Do you think brown rice would work? Hey Jenny! Sorry for the delayed response – I've never tried this with rice! It may be a little weighed down, but still could work 🙂 Would LOVE to hear if you give it a go!! Love this! Wish you had a print button for your recipes. This was super good! Thank you! Enjoying every bite of it right now!! Pleasantly surprised!! Thank you!! This was amazing! Even my 7 year old loved it! I doubled the spinach and added lemon … YUUUUMM! Thank you for a great recipe! Hey Veronica! Yay for you and your daughter both loving it! Great call doubling the spinach and adding lemon 🙂 Yum!!! Thanks for the sweet message, have an awesome week! My family and I recently started eating more healthy foods, and this recipe was one I saw on Pinterest that I just had to try. It looked so delicious. We had this for dinner tonight and it tasted just as delicious as it looked! I added chickpeas to make it a bit more filling. Like you point out in your post, it's amazing how such simple ingredients can create such complex and delicious flavors. My daughter had three servings. I'm excited to try some of your other recipes, thanks for all the great, healthy inspiration! Aw, thanks so much Stephanie 🙂 I LOVE your addition of chickpeas! Great idea, definitely doing that next time! Hope you enjoy any other recipes you try! Awesome Natalie!!! And thanks for the kind words about the site 🙂 Hope you're enjoying your challenge! Just made this made this for dinner tonight and It was awesome!!!!!! Very light on the tummy and fulfilling at the same time. I added almonds to mine. This looks delicious! Do you have any suggestions for a substitute if I don't have red wine vinegar? Thanks so much! Aw, so great to hear 🙂 Glad you enjoyed your first quinoa experience! Have a wonderful weekend! Great recipe! I found adding fresh lemon juice prevented the avocados from turning brown if you want leftovers for the following days. Oh and I used the tricolor quinoa which made it look even prettier! Yes and yes!!! Great call adding lemon juice! I definitely need to try this with tricolor quinoa 🙂 So glad you enjoyed it – have an awesome week! I was so late to shop but when I saw this recipe I was oh yeah we have all this in the cupboard and frig just need to run to the corner store for the green onions yay!I am going to have it with pollock delish can not wait thanks a bunch! I made this for a picnic. It is very good. Next time I will double the spinach and add lemon juice or zest to the dressing. I love that it's good made ahead. Thanks for the recipe! Hi Karon! So glad you enjoyed it for your picnic 🙂 Great call adding more spinach and the lemon addition for next time – yum! Have a lovely weekend!! I love this. Thank you. I sprinkle a little feta before serving. It tastes better cold. Great to hear! I agree – the flavors really intensify after chilling in the fridge 🙂 Have a beautiful weekend! I love this recipe! I make it pretty frequently and it's good to take to dinners with non vegans, as they all like it too! Also it's a super good left over. Awesome! Thanks for your feedback 🙂 So fun to hear the carnivores enjoy it too, that's always my favorite thing to hear 😉 Wishing you a very happy new year!! I just made this salad for lunch and OMG…..it's AMAZING!!!!! I love every ingredient in it!! ADDICTED!!!! Yay!! Apologies for my late response but so glad you enjoyed! Appreciate your feedback 🙂 Have a beautiful week!